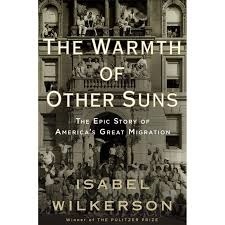 One of the finest books I ever read on "The Blackman's Reading Hour, Project Uplift Literacy written by Isabel Wilkerson, The Warmth of Other Suns, publication date 09/07/2010. The book tells the story of the great human migration of black from the southern states to the Eastern, Central, and Western sections of America from 1910-1970. What an outstanding book. This book should be in every black home in America. It is an excellent read aloud book to discuss ancestry with your children. There are not many books that should be staples in every black home in America but this book indeed belongs in each and every home. I do love Isabel Wilkerson so much for writing this masterpiece.